Padraig Harrington has no concerns about Rory McIlroy handling his collapse in the US Masters-- but he believes Tiger Woods may well deeply regret his back nine finish. Harrington said that once he saw McIlroy after his bad round handle the media queries with class and style his fears disappeared. 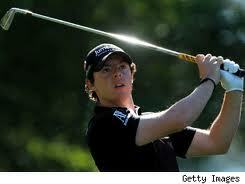 "Rory did incredibly well afterwards," Harrington told the Irish Independent. "In a week's time, he'll have had time to reflect, but his attitude so soon after walking off the 18th green on Sunday was fantastic and augurs well for his future. "He'll come through this. Rory has proved many times he's capable of winning these things, but I think even more so after Sunday. He'll win plenty of Majors going forward." "He's always going to have a great chance at Augusta and he had it again. If he looks back at this week, Tiger will see this as one that got away."